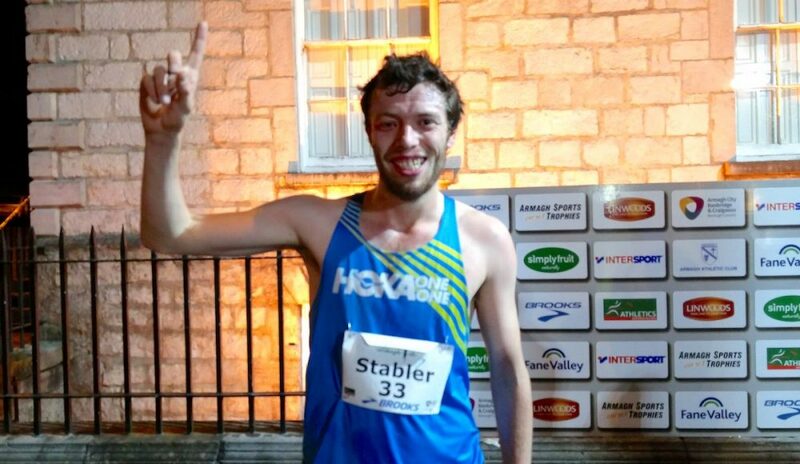 Sam Stabler and defending women’s champion Laura Weightman won at the Armagh International Road Races in Northern Ireland tonight (February 15). Racing for the first time in Armagh and his first 5k on the road, Stabler proved to be the unknown quantity among a host of familiar faces and clinched the win in a lightning fast 13:59, while course record holder Laura Weightman clocked 9:00 to finish within one second of her 8:59 best last year. 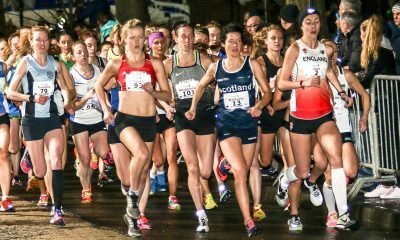 Once again race organisers amassed fields of incredible depth and despite the chilly temperatures 93 men dipped under the 15-minute mark for 5km and 34 women under 10-minutes for 3km. 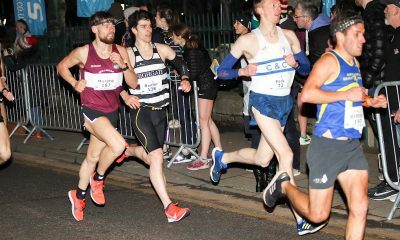 The lapped race around the Mall in Armagh, that measures just over 1km, saw a tightly packed group of about 20 men at 3km with Charlie Hulson taking over from Dewi Griffiths who lead the first two laps. As the race progressed and the bell went for the final lap any one of 10 had the potential to take the 2018 crown with America Jordan Mann leading. As they came down the home stretch Hulson made a move to pull away, but Leeds Abbey Dash winner Stabler held on and kicked at the vital time to take control. From that point, the race belonged to Stabler and despite the best efforts of chasing 2016 winner Hulson and Mann, the jubilant Stabler held on to win the 28th edition of the Armagh race just dipping under the 14:00 mark. 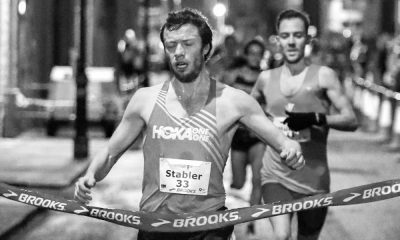 “I went out so conservatively because the shapes not quite there yet, I think I was 30th or 40th after the first lap,” Stabler told Fast Running. “I then quietly moved up going into the bell and then I spotted a gap and suddenly found myself shoulder with first. “That was the move that got me in contention. Coming into the home stretch Charlie Hulson made a big move, but I kept waiting because Dewi [Griffiths] gave me some great advice, ‘don’t kick until the cones’ and I just went. Hulson took second in a three-second personal best 14:00, with Ocean State’s Mann, who finished eighth last year, taking the third podium step in 14:01. Elsewhere England’s Graham Rush and Scotland’s Luke Caldwell finished sixth and seventh both in 14:05, while the young Mahamed Mahamed impressed for England to finish 10th in 14:07. Dewi Griffiths was racing for the time in 2018 after his hamstring injury at the Euro Cross Country Champs in December, ran a strong race and finished 11th in 14:07. Matt Bergin, 10th last year, was the first athlete in the green of Ireland in 14:08 for 12th place. With Hulson and Griffiths in the top 11, the Wales’ A quartet won the men’s international team title, with England second and Ireland third. While the top ranking club was Swansea Harriers. Weightman said before the race she hoped “for a good hard fast race” to test herself after five weeks at altitude in South Africa and she certainly got that with Jess Judd pushing her all the way. But it was the two-time Olympic finalist who just had that extra bit of strength and pipped her challengers to the win in 9:00, just one second off her own course record. 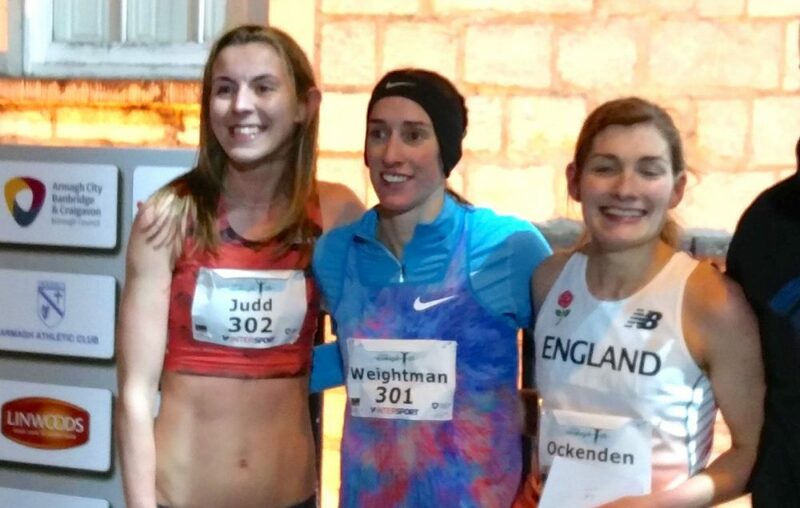 Fellow London 2017 participant Judd gave Weightman a fantastic race and lead for the first two laps, however, two-time Olympic finalist Weightman knows what it takes to win in Armagh and duly delivered with the important kick down the home straight to clinch the win. 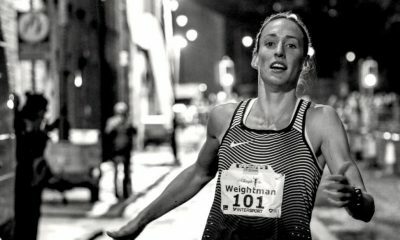 “It was hard out there, it was really cold compared to last year, hence all the clothes I am racing in,” a shivering Weightman said after winning her second Armagh title. “I found the cold quite tough on my chest and was breathing quite hard. Judd finished second in a big eight-second personal best 9:03, with the ever improving Verity Ockenden finishing third in the vest of England with 9:14. Elsewhere Team New Balance Manchester’s Lauren Howarth impressed to finish fourth in 9:15, while Amy Griffiths was the next from England’s team with 9:18 for fifth place, and Northern Ireland and Ulster’s Emma Mitchell finished sixth with 9:19. Scotland’s Steph Pennycook completed the top 10 with a four second PB 9:26, while race organisers Armagh AC’s Fionnuala Ross finished 12th in 9:28. England won the women’s international team title, with Northern Ireland and Ulster second and Scotland third. The club win went to Leeds City AC. With 77 men going under sub 15-minute mark and 28 women under 10-minutes last year – this year’s field truly delivered and maintained the upward curve. A special mention should also go to Class of 2018‘s Dave Norman who continues his comeback with a great 15:25 performance in the Armagh 5k. The final race of the night, the open men’s 3k saw a new course record set Polish athlete Michal Rozmys in 8:30. Second and third were two young Northern Irish athletes Craig McMeechan in 8:43 and Jack O’Farrell in 8:59. The full results from the action in Armagh can be found here.